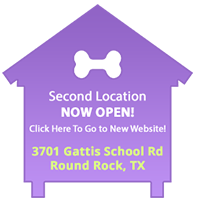 Purr-fect Pets, located in Georgetown and Round Rock, Texas is the area’s premiere AKC Certified pet grooming shop and offers professional services to all breeds of dogs and cats, small or large. Whether you’re looking for Fido or Fluffy to receive a professional bath or for them to show off a perfectly groomed coat, we can accommodate all your pet grooming needs! Cathy Morin, owner and operator, purchased Purr-fect Pets Georgetown in 2006. Cathy operates the shop and has two dogs of her own, a lab mix and a chow mix. She says, “How can you ever be in a bad mood with all the dogs around?” This is made evident through the shop’s cheerful and inviting atmosphere, and more importantly, the experienced professionals who enjoy working with animals. The professional staff at Purr-fect Pets Georgetown has worked as a team for several years, and each of our staff love what we do! Not only can we groom and treat your pet with utmost respect, but we also genuinely care about participating in our local community. That’s why the staff at Purr-fect Pets Georgetown provides grooming services for dogs at the Georgetown Animal Shelter. Contact us or stop by today. 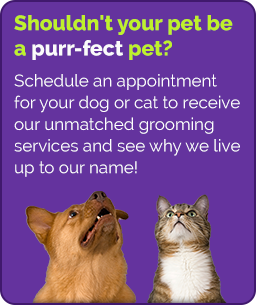 We look forward to providing all your grooming needs and would love to meet you & your pets!